BEFORE WE GET INTO THE REVIEW – I CURRENTLY HAVE A GIVEAWAY GOING ON FOR A FULL SET OF THE NEW FIRST AID BEAUTY HELLO FAB SKIN TINTS + MULTI STICKS GOING ON THROUGH THE 17TH! ENTER NOW! 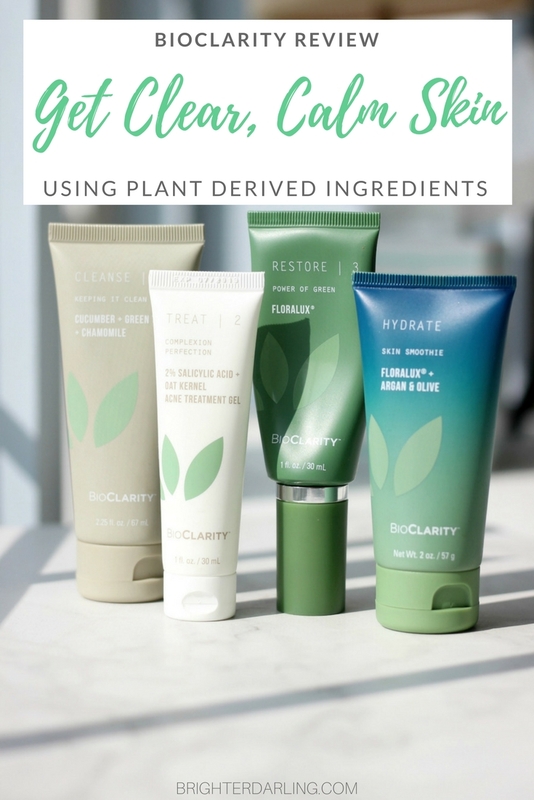 BioClarity is a plant-based skin care system that comforts while it corrects. It’s BIG on soothing and calming ingredients like chamomile and cucumber. 2% salicylic acid blended with oat kernel promise to battle breakouts while reducing inflammation. Most interesting, though, is their proprietary Floralux® ingredient that’s derived from actual plant chlorophyll. Floralux® detoxifies, helps repair damaged skin cells/wounds, contains antioxidants, and includes vitamins A, C, E, and K. It’s a game-changer when it comes to healing and restoring the skin to a healthy state. 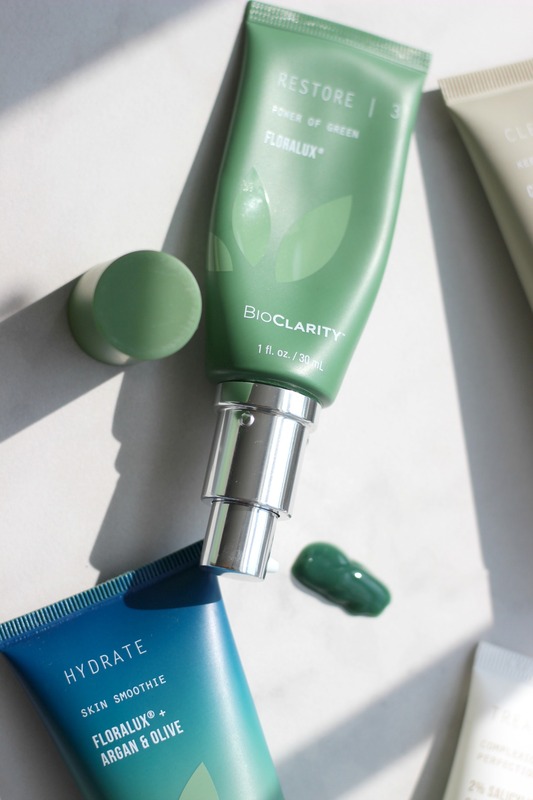 BioClarity’s core is a 3-step system composed of a foaming gentle cleanser infused with cucumber and green tea, breakout-targeting salicylic acid gel, and the skin-restoring, green Floralux® serum. BioClarity also sells a hydrating moisturizer that contains Floralux®, as well. It’s lightweight, gel-based, and works well under makeup. It does not contain SPF so be sure to supplement with your favorite sunscreen. I use all of the products morning and night. The first week, I did notice the salicylic acid gel caused a bit of minor flaking, so I scaled back to using it only at night, and eventually built up to 2x/day. The biggest change I noticed in my skin was almost immediate. 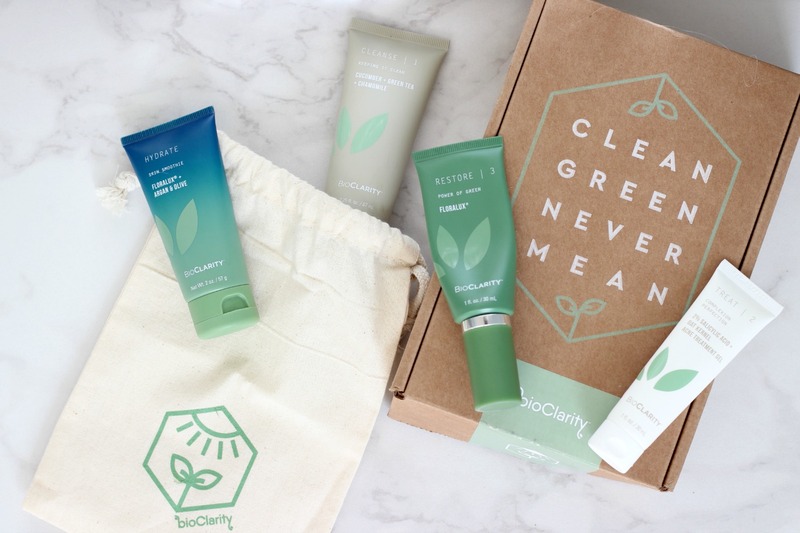 When I washed my face the first morning after using BioClarity, my skin felt so soft and smooth I thought there was some sort of film left on my face. Nope. Just naturally soft and smooth skin. Within a couple more days of use, I’d wake up to a noticeably less-red, calmed complexion. Breakouts seemed to naturally subside and those that seemed to want to crop up quickly dissipated without any inflammation. After about two weeks of continued use, I started enjoying clear skin days every morning. When I had breakouts in my teens/early 20s, I always wanted to strip my skin with the strongest rubbing alcohol and strongest over-the-counter treatment I could find. I’d apply it multiple times a day and just end up with irritated, flaky, ruddy-looking skin. Now I know a lot better and I love that a system like BioClarity exists to comfort – yet correct. Where was this when I was 16?! 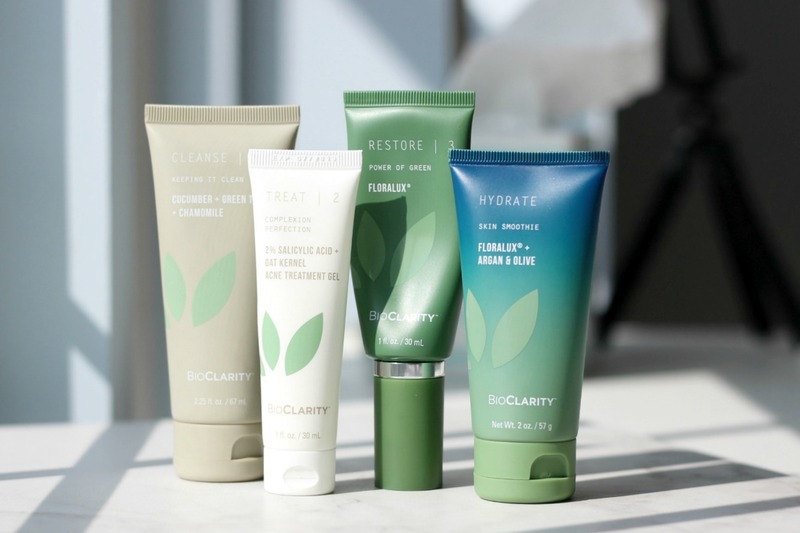 The team at BioClarity is offering my readers a SWEET 50% discount on your first set of BioClarity products. The products are on a subscription basis, so they come in ~30 day supply sizes. You can cancel ANY TIME. The 3-step system including cleanser, treatment gel, and Floralux® serum normally costs $29.95/month + free shipping, but if you shop through my referral link and use code DARLING at checkout you get to try it for 50% off. DON’T FORGET TO ENTER MY GIVEAWAY OF THE NEW FIRST AID BEAUTY SKIN TINTS + MULTI STICKS GOING ON THROUGH 9/17! 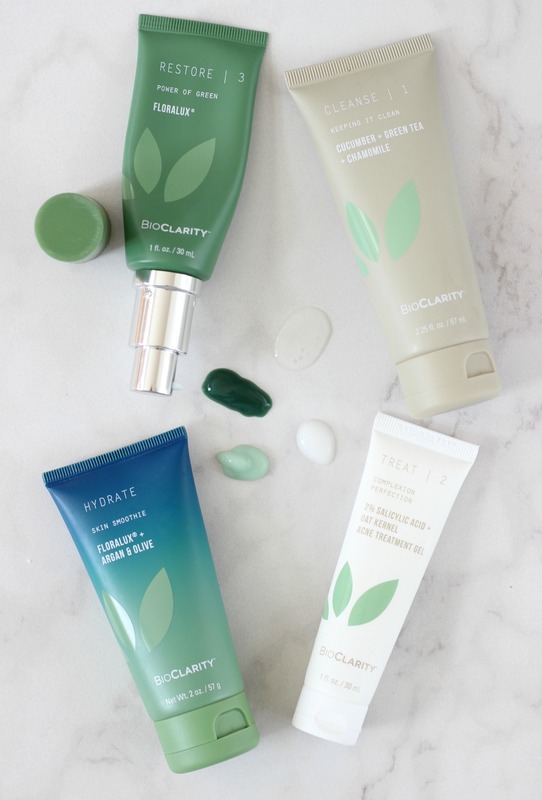 What do you think of the BioClarity line? Let me know if you plan on giving it a try OR if you’ve tried it already! I hope this product helps you find softer, calmer, clearer skin like it does for me. "Save vs Splurge: Fall Fashion Trends 2017"